As more and more golfers turn to the gym to improve performance and durability, golf fitness is pushed into mainstream discussion and, with it, comes misinformation about the what, why and how. The most prominent spat came in February when Golf Channel's Brandel Chamblee voiced his concern over Rory's physique and penchant for strength training. Rory infamously responded by tweeting a video of him doing squats which further fueled the debate (TPI instructor Jason Glass addressed Chamblee's comments in a video we posted on our site). Just before the Masters, Brian O'Connor of the Irish Times (whose bio describes him as a Horse Racing correspondent) shamed Rory for his dedication to fitness. Most recently, Michael McCarthy of the Sporting News agreed with Johhny Miller's Open Championship rant that Rory's failure to win in 2016 was the result of an obsession with "tight shirts" and too much time in the gym. One common element in these three examples is that none of the authors interviewed a single performance coach, offered any background about Rory's workout programming or took the time to educate themselves about WHY golfers lift. We've evaluated Rory numerous times at our Oceanside headquarters and put together the video above to provide some context for why Rory lifts weights. As you'll see in the video, Rory creates TREMENDOUS separation between upper body and lower body and rotates his pelvis as fast as anyone on TOUR. Measurements that we took with Rory in our 3D bay indicate that he creates 65° separation of upper body and lower body (PGA TOUR average is 45°) and rotates his hips at 720°/sec (PGA TOUR average is 550°/sec). Over the course of many years, that type of explosive movement is a potential recipe for disaster if the body does not have an adequate strength foundation. Rory had to get stronger. The media criticism isn't limited to Rory, either. In May, after winning his third tournament in two months, Jason Day credited his improved durability and consistent performance to a renewed off-season commitment to fitness and nutrition. Chris DiMarco responded to Day's comments by saying that young players are "doing too much lifting" and that "we are seeing more injuries due to working out." As Dr. Rose says in the video, you can hurt yourself by doing stupid stuff in the gym, but these comments suggest that gym-related injuries are common. The reality is that they aren't. It's interesting that golf is the ONLY sport where athletes are criticized by media for trying to become stronger. Think about it: if a baseball player goes down with an injury, announcers and beat writers don't shame him for doing squats. The vast majority of analysts and media members seem to support golfers being in the weight room, but those that disagree tend to make the most noise. For every critical statement made on air, there are hundreds of pieces of content created by the TPI and greater golf fitness community that support strength training. Here are a few recent pieces that we wanted to highlight which dispute the claim that lifting weights is bad for golf. That being said, strength is just a small portion of the golf skill continuum. Continually chasing personal bests in the gym may not always translate to golf course performance. As Buchan states, “Strength will reach a point of diminishing returns in which in order to get stronger you will spend time in the gym accumulating training volume that for golf performance could be better spent focused on other areas of their game improvement.” Once standards for strength are met, a golfer should focus on skill development. The most criticized form of training among golfers recently is Olympic lifting. Nigel Tilley, a physiotherapist for the European Tour, believes Olympic lifting can be beneficial for golfers, specifically because it requires both speed and technique. “Olympic lifting is training someone to build power at a greater speed with control at the end point of acceleration. This is vital for golfers.” That being said, very few golfers are suited to training in the full spectrum of Olympic lifts. The type of training an individual needs is dependent on their specific “limitations, abilities and requirements.” A skilled strength and conditioning coach is required to determine which components of Olympic lifting are both safe and beneficial for an individual. Furthermore, a golfer should have foundational movements mastered before they progress through an Olympic lifting program. Golf is such a one-sided rotational sport and I believe that focusing on multiple sports throughout your formative years is really paramount to become a balanced athlete. Ensuring you are athletically balanced in both directions will help prevent the one-sided rotational pattern developing and keep you on the fairways. Waghorn points out that the games' greats were did not escape injury: “Jack Nicklaus and Tom Watson have both had hip surgery caused by the one-sided rotational demand of the game.” A golfer's pelvis withstands up to 9G of force while hitting a driver; this is the real injury risk. These are just a few examples out of literally hundreds of pieces that we could choose from. We aren't trying to bash the media and we recognize the challenge with producing hours of compelling golf content (some of which is filmed live). Part of the problem is that media members are often debating it amongst themselves and we felt it was important to add our perspective (ESPN's Kevin Van Valkenburg noted on Shane Bacon's podcast that the majority of the most vocal critics of strength training are retired golfers who didn't lift weights during their careers). Overall, the narrative that golfers are "hurting themselves in the gym" is tired and unfounded. It's also somewhat disrespectful to the athletes and the professionals advising them (like Rory's trainer Dr. Stephen McGregor, a speaker at our upcoming World Golf Fitness Summit) to suggest that their commitment is born out of vanity, not performance (according to statistician Jake Nichols, Rory has played at an elite level this year). We greatly respect some of the folks that have criticized fitness, but hope we've been able to provide some context. The photo caption used is just a photo of a single snap shot. A video would reveal more about what is going on. It may be true that in the full deep squat position a greater force is applied between the patella-femoral joint, and much repititions over a greater amount of time may be damaging. But that compression and relaxation (in standing) creates fluid movement in the cartilage which is beneficial. Also, for lighter resistances, going slow through full range of movement would be so beneficial in creating strength through out the full range of motion of a joint, instead of just working the mid ranges. (this picture looks like the lighter side of resistance for a squat). So don't jump to conclusions over a single picture of a deep squat that may be damaging in the long run. Strength in a joint through full range of motion is a good thing. Slow, controlled movement is the key when at end ranges. Strength, flexibility is created going through full ranges of motion. Don't bounce or be ballistic at the end ranges which would risk injury to cartilage, tendons and ligaments, and muscle. Especially at the knee joint, attached to the two longest bones in the body (ok, three bones), strength and stability is most important in life, sports and every day functional mobility. While I agree with the concept of taking a "holistic" or more comprehensive approach between fitness, diet and golf, I must politely chide you for the photo caption used. 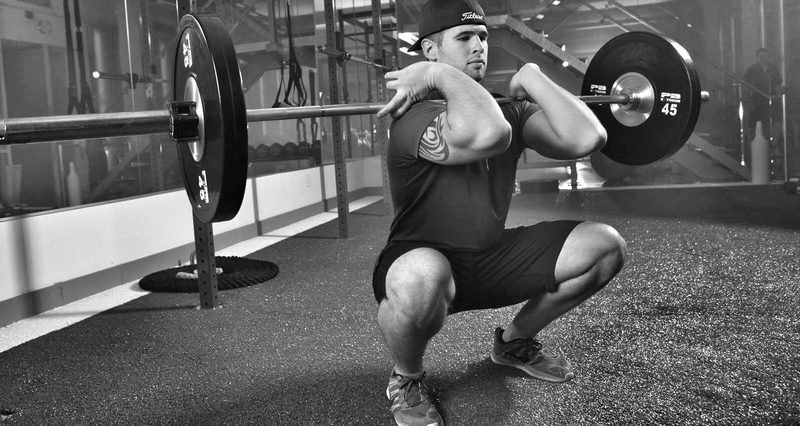 You have a fellow performing deep squats with knees bent in excess of 90 degrees ... and as several orthopaedic specialists and at least one kiniesiologist that I know, will unequivocally state that this technique is damaging the body in the longer term. Physical fitness and sports should pursue such short term gains in strength at the expense of long term physical well being.